Welcome to Anchor Point, Inc.
tax-exempt corporation that seeks to improve family and community well-being as we provide education, mentoring, job skills training, and business incubation opportunities for youth and adults through community collaboration partnerships. creed, or color. Learning to "Live Life Well" is our motto. We have seen lives changed, young people have realized they are capable of far more than they knew, adults are encouraged to live their lives differently through positive interaction with one another and challenge themselves beyond their comfort zones through a variety of relationships, education and adventure. Working together in collaborative efforts with our partners to provide job skills to our volunteers is one of the most important things we do. Of the 60 program participants in the last 2 years, we have seen approximately 50% of those trainees go on to full time job placement in the community. Our program is unique in that we work with any individual who is willing to apply themselves to preparing for a job, no matter what their history has been or the challenges they face and we get results! We help secure ID Cards, Drivers Licences, GEDs, Birth Certificates, etc. Several area business owners work with our staff-in-training to provide business mentoring and employment coaching. As a MD Food Bank agency, in the last 18 months, we have distributed over 200,000 lbs of food feeding over 14,000 food insecure individuals of our community. We raise the funds to purchase this food from the proceeds of the Thrift Store. Our staff hosts a growing community-based distribution each Tuesday during the growing season. Health care counselors from organizations such at Associated Black Charities, Dri-Dock Recovery, and others set up tables to interview and assist our clients with alcohol and drug recovery support, pre-diabetes screening, blood pressure and obesity challenges. Healthful eating recipes and samples are shared each week with our clients to educate and improve quality of life through the Market to Meals Program. 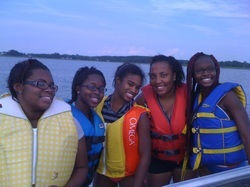 Through all of the activities of Anchor Point, Inc. we especially love the adventure aspect. Whether it is taking our staff-in-training out on fishing trips, taking youth out on sailboats, working with community day camps, helping local youth groups raise funds and serve the community at the same time, engaging local law enforcement officers and at-risk youth in mentoring projects, our staff-in-training get an opportunity to be involved in an organization that truly gives back to the community on many levels. Life should be and is “One Great Adventure” !! These services provided at no cost to the participants. Please consider participating in changing the direction of the lives of youth in our community.